Store Manager Allison Kemp with Eddy Goodfellow from the Gala Committee. "We’re very happy that Scotmid has been able to sponsor the pipe band." 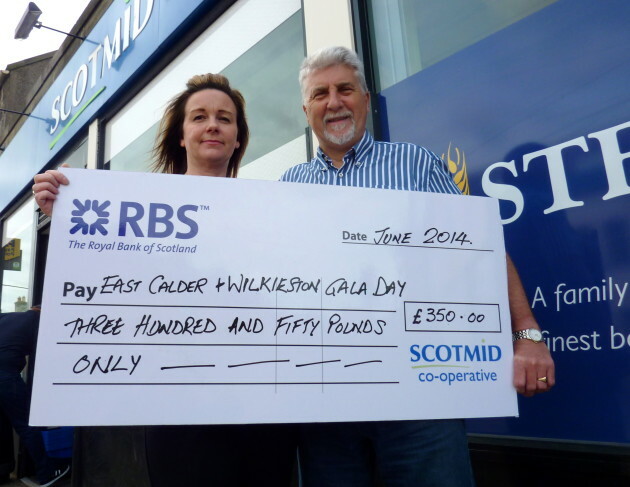 East Calder and Wilkieston Children’s Gala Day has been given a welcome boost from Scotmid Co-operative, after receiving a £350 donation to pay for one of the pipe bands that will be performing at the community event on 14 June. Scotmid’s donation will be funding the Edinburgh Post Office Pipe Band, who will be entertaining the crowds and parading through the town on the day. Allison Kemp, Store Manager at Scotmid’s East Calder store on the main street in the town, presented the cheque to Eddy Goodfellow, Secretary of the Gala Committee. East Calder Gala Day will be held on 14 June and is open to the community. It was first started in 1919. Community groups and projects can apply by completing a community grant form from their local Scotmid store or online. Community groups and projects must meet certain criteria to be considered for funding. The applications are then considered by their Regional Committee before being awarded.